Our study found that Malaysians remains an avid online shopper during Ramadan and begins shopping as early as 4am onwards. In fact, the surge in online traffic at these hours shows that Malaysians shop online while they ‘bersahur’. The month of Ramadan marks the most important time of the year for many Malaysians. For 30 days, more than 61% of Malaysians will alter their daily lifestyle to spend more time in prayer, fasting, doing good deeds and charity. This annual shift in lifestyle usually changes how consumer shops online as well. In addition to this, many will purchase gifts, to prepare for the impending Hari Raya celebrations. 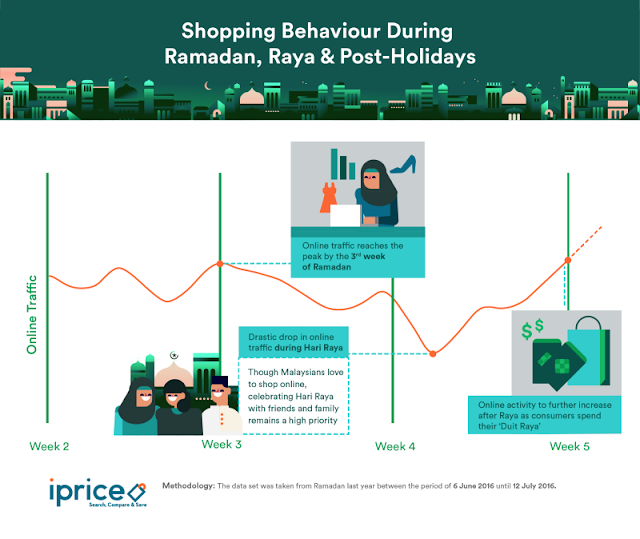 As such, iPrice Group, a Malaysian meta-shopping website for hundreds of local and foreign e-commerce for Malaysians, made a study to understand online consumers’ behaviour during month of Ramadan. By studying online traffic from more than 350,000 sessions during Ramadan this year, comparing it the regular seasons and analysing historical data from last year, we found four interesting facts about Malaysians online shoppers during Ramadan. 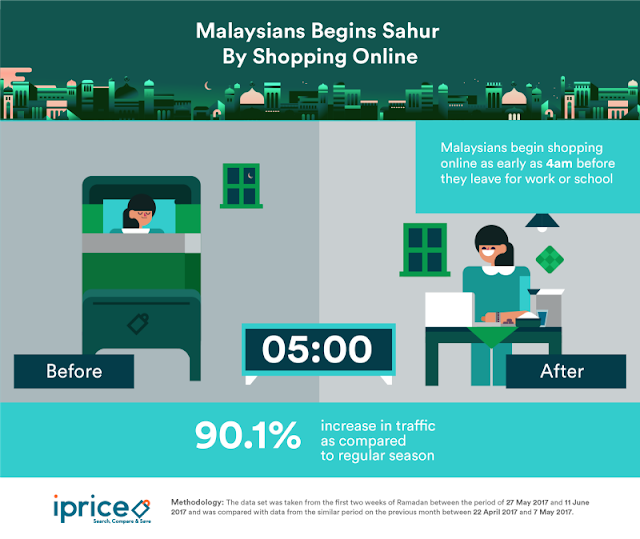 Our study found that Malaysians remains an avid online shopper during Ramadan and begins shopping as early as 4am onwards. In fact, the surge in online traffic at these hours shows that Malaysians shop online while they ‘bersahur’. By 5am we see a 90.1% increase in online traffic when compared to the non-Ramadan period. After the morning prayers have completed, we could see that online traffic would continue to increase. This shows that Malaysians continue to remain active online before they leave for work or school. 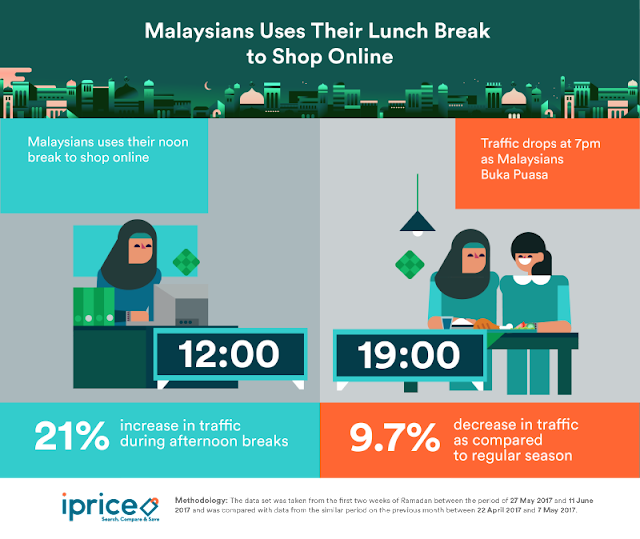 While we might see lesser people in restaurants during lunch hours on Ramadan, the online shopping arena is busier than usual. There was a 21% increase in activity as many would be shopping online during their lunch breaks. Online shoppers remain active throughout the day as we would reach our peak traffic by 3pm during Ramadan. Subsequently, Malaysians will then begin to end their work or school day and begin to break-fast. After 3pm, we saw a gradual decrease in traffic with a 9.7% drop with online traffic by 7pm as Malaysians ‘Buka Puasa’ at this hour. Malaysians begins shopping again by evening but it remains lower when compared to the previous month. During regular seasons, consumers are most active at 10pm. But as Malaysians are up much earlier during Ramadan, consumers at this period would be most active only by 3pm. Online traffic during the evening is reduced as many would break-fast and will end their night early to prepare for the following day. As we enter the 3rd week of Ramadan, the Raya-Mood usually kicks in as we realise Hari Raya will happen in less than a week. Brewing with excitement for the joyous occasion, online traffic will reach its highest at the third week of Ramadan. In addition to this, we should expect to see a surge of last-minute online shoppers by the 4th week of Ramadan. Just three days before Raya, we can see a slight increase of traffic indicating that many will still shop at the 11th hour. 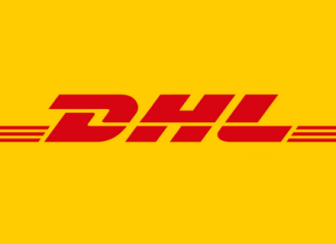 This is only possible in the recent years as local delivery services are now more advanced to deliver products purchased within the same-day delivery and with more efficient payment options available. Finally, as Hari Raya takes place, e-commerce should expect to see a big decline in online traffic. Though Malaysians love to shop online, celebrating special occasions with friends and family remains a higher priority during Raya. After Hari Raya is over, expect to see Malaysians shopping more than before. By the end of June, many would have received their Raya Duit. This may come through monitory bonuses from employers or green packets given by relatives. Regardless, data from 2016 showed that Malaysians will go online to spend their ‘Duit Raya’ after Hari Raya is over and we should expect to see this happen in 2017 as well.